This message was preached by John C at Word of Grace Church on November 11th, 2018. To listen/download the audio please click here. To listen to the Sunday's worship and prophetic contributions please click here. Forgiven – we have this too. We are not trying to earn forgiveness or justify ourselves. Forgiveness was bought for us by Christ at the cross and is here, now and ours. 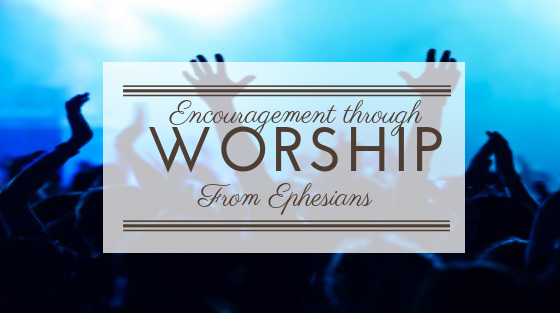 Paul’s letter to the Ephesians is one of the most powerful books ever written. These six short chapters gripped me as a young Christian and became the foundation for my understanding of who I am and what God’s purposes are. We are going to spend some time working through this letter and reminding ourselves about the foundations of our faith. We will have a few weeks of edification, they move on to exhortation. Today we are going to focus on praise: Praising God for what he has done in Christ is a great means of building ourselves and one another up. Blessed – we mean thanked, honoured and recognised for who God is and for what He has done for us. The power of praise is this: it focuses us on the truth and lifts us from a natural perspective that tends to get bogged down, to the life of God and his view of things. There is passion and there is theology found in these verses; hot truth, raw energy, and deep thoughts sufficient to last a lifetime. They remind us of things we are prone to forget. “You have forgotten who you are!” Michael Griffiths spoke off the church as “Cinderella with Amnesia.” Paul wrote this letter to people who already knew these things. Look at what Paul says and begin to rise up in your spirit. This was probably a circular letter, true for Ephesus and true for us. You are not simply an ordinary Christian. There are so many lies that we tend to believe are the truth. This passage tells us the truth! We have been blessed with all we need in the gospel. Paul’s great outburst of praise begins with a general summary in v 3 which he expounds in the following verses. – A trip down memory lane, look back at where you have come from. God started his work in your life before the creation of the world. Not to be driven through life by the world's ambitions. Holy indicates that we are to be different from the world outside of Christ. By becoming a disciple of Christ I have a discovered a lifestyle and a purpose that separate me from everyone else. I did not become a Christian against the will of God. He ordered my destiny. Adoption means that we have become God’s children: taken from the destitution of our sin and added to the royal family (Eph 2:2-3 cf. Eph 4:13, Rom 8:29, Gal 3:26, 4:4f). There may be accidental additions to natural families, but there is never an unexpected addition in the family of God. Graced (v 6) – all these gifts come freely to us from God not because of what we have done, but by his grace. Praise him for it and enjoy it to the full. All this is past tense. These things are ours. They are true of every Christian no matter how weak they may look or feel. This is the truth! We are no longer under the governing power of sin, but now we belong to Christ and should think of ourselves as his. Redeemed – we have it, and Christ has us. Redemption indicates that we were bought with a price. All this is present, but there is more to come. A Christian is promised more than they now possess, but what we experience here is the foretaste of what is in store for us. Enlightened – we have a revelation in the scriptures and through the Spirit. God has shown us what the world cannot know or deduce that He will make Christ supreme over all things. Included - Paul makes it clear that God intends to gather all his people redeemed through history to praise the Lord together forever (v 11-12). There is a place for us in the Kingdom of God. How do we know this? The gospel is the most important message in the universe as our response to it determines our destiny. Do you believe in Jesus Christ? Have you received his forgiveness? Have you placed your confidence in his sacrifice at the cross? Then by faith you are included. The gift of the Spirit is given to assure us that we are saved. His ministry in our lives is a foretaste of heaven. A guarantee of what is to come. These truths are therefore vital for us all to live on, and to be the source of our worship, identity and security. 1. Let our praise to God be in truth as well as in Spirit. 6. Let our praise be full of hope and confidence. Why do you think Paul started his letter with a paragraph like this (v 3-14)? How would you summarise the main point in a short sentence? What does this tell us about how God has changed our past? What difference does this make to our outlook on ourselves? How does praise neutralize pride? In what way does worship in truth feature in your devotional life? Pray for one another that your lives may express more substantial, Spirit-filled, Trinitarian, joyful, passionate and confident praise.